Massey Ferguson 50 Series of skip loaders is a classic skip loader that many contractors still use to this day because of its power, and performance in the construction and landscaping industries. When working with any skip loader where dragging dirt is part of the job, its important to make sure you have plenty of tread on your tires to get the most traction and dragging power. Monster Tires offers a great selection and low prices on Massey Ferguson Skip Loader Tires if you are running into issues with tire slipping. Contact us today to get the best prices in the industry. Affordable Massey Ferguson Skip Loader Tire Resource. If you need affordable replacement tires for your Massey Ferguson Skip Loader, you have come to the right place at Monster Tires! We have Massey Ferguson Skip Loader Tire Size Options in affordable prices, including 50EX – 650 Skip Loader Tires. You can choose a Set of 4 tires for Massey Ferguson Skip Loader, Front Tire Set for Massey Ferguson Skip Loader, or Rear Tire Set for Massey Ferguson Skip Loader. Here at Monster Tires, we offer affordable Construction Tread Tires for Massey Ferguson Skip Loader so that you can get your skip loader back to work! High Quality Construction Tires for all your equipment. The quality of your tires is incredibly important to the performance of your Massey Ferguson Skip Loader. It is tempting to shop for cheap Massey Ferguson Skip Loader Tires, but in fact cheap tires often just end up wasting you money as you have to replace them sooner. For high quality Off the Road Tires for Massey Ferguson Skip Loader, we have the great prices and great quality you need! 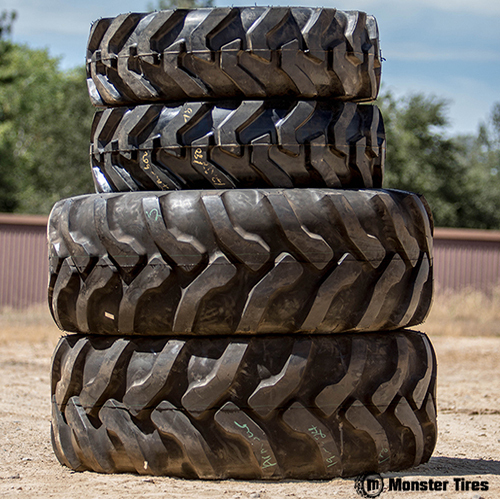 Trust in Monster Tires for your next set of Massey Ferguson Skip Loader tires!